Built on three levels, the house was sympathetically restored in and the adjoining barn was converted into a fully equipped guesthouse. All the ceilings have exposed wooden beams and the floors have original terracotta tiles. The ground floor has the kitchen/dining room, and living room, with french doors leading onto a covered terrace and brick built bread/pizza oven. In front of the house is a lawn for games. The swimming pool is a huge 6 metres by 13 metres and is set above the house and up a flight of steps. On the first floor of the main house there are 2 bedrooms (1 matrimonial and 1 twin) and two bathrooms (1 en suite to both bedrooms). The guesthouse has a 2 bedrooms (both with twin beds), 1 large shower room, a kitchen and living/dining room with fireplace. For a more extensive description of the property (and more photos) we refer to our own website (please google casanuova150.weebly). Set at the top of a hill, at the edge of chestnut wood, in three acres of its own land. On the edge of a small village (Gugliano), Casa Nuova has great views, privacy and a huge pool. Both the house and the barn have been beautifully converted and have all mod-cons. The house sleeps 11 people in 4 bedrooms, (2 bedrooms have matrimonial beds, 1 bedroom has twin beds and the 4th bedroom is set up as a dormitory, with up to 5 single beds) with two bathrooms and a shower-room. The guesthouse sleeps 4 in a further 2 bedrooms (both bedrooms have twin beds) and one large shower-room/bathroom. In the house there is internet access, satellite TV, DVD, dishwasher, microwave, etc...In the barn there is a washing machine and, dryer. Outside is a covered (and heated) terrace with a large table and seating for 16, a huge pergola by the pool, and other terraces. There are vines and fruit trees, and a brick built pizza/bread oven. In front of the house is a lawn for games. The track from the church to the house (150 metres) is not maintained by the local council and though perfectly OK for normal cars, is not recommended for sports cars or other cars with a low body. We are a Belgian family of 5, living in the flemish part of Belgium, near the historical city of Ghent. We bought the house in 2013. The former owner still acts as our local property manager and will welcome you wholeheartedly. We also have our own regular vacation stays at our property with family and friends throughout the year. Lucca is a very nice, fully walled, historical city. The Lucca area is ideally located, close to airports and close to beaches, other historical cities (Pisa, Pistoia, Firenze,..), impressive mountains (Apuan Alps), wineries and all those other nice things Tuscany has to offer. Casa Nuova is an authentic Tuscan farmhouse with adjacent guesthouse, both restored with good taste by the previous owner. The property comprises a large pool and garden with fruit trees, vines, lawns and woodland. This property is unique because of it's breathtaking views, it's peaceful surroundings, large pool and garden and above all, the ideal location. The outdoor shower is near the swimming pool. There is comfortable seating for about 8 guests the living room of the house. There is also a living room in the barn with seating and dining table for about 4 guests. In summer dining can be organized on the covered (and heated) terrace. The 2 wooden tables seat easily 16 guests. There is a terrace off the lounge of the main house and one off the bedrooms of the barn at the back, as well as a large grass garden area in front of the house. The guesthouse is wheelchair accessible with the a sofa bed and bathroom/shower on ground floor. The pool has steps that stretch the entire width of the pool, making it ideal for small children or people who like to sunbathe half in and half out of the water. The swimming pool has steps across the entire width of the pool, making it ideal for small children, or for adults who just feel like being half in and half out! There is a small library on the second floor landing for guests to make use of and some toys and books for smaller children. We appreciate any additions made by guests! In the living room there is also a DVD player. The house can be rented separately from the barn. During the winter months we do not let the house to more than 8 guests as the communal rooms cannot support more. We have had a superb stay at Casa Nuova. Splendid location on a steep hill with awesome views over the surrounding forests and far-distant mountains. Also ideally located for visiting near–by villages like Lucca and Pisa. We rented the house together with friends and we all had big fun. While the parents enjoyed the great cooking facilities (including a wood-heated pizza oven! ), the children had great fun in the beautiful swimming pool and gardens surrounding the house. The house is also very well taken care of: nice team of local people took well care of the garden, swimming pool and the cleaning of the house, and the concierge Claire was at any time reachable for all good advice. Surely a place that we will consider for a next holiday! Vi har haft en fantastisk uge med børn, svigerbørn og børnebørn. Casa Nuova er en dejlig autentisk hus, som ligger i den mest pragtfulde område oppe i bjergene. Børnene boltrede sig fra morgen til aften i den skønne pool. Lokale “kokke” fremtryllede et lækkert aftensmåltid til os, de serverede og efterlod køkkenet rengjort. Samarbejdet med udlejer har fungeret 100% og Vi giver gerne vores varmeste anbefalinger til fremtidige lejeretak for denne gang. We were lucky to have owner Wim around during our stay. He is without any doubt the perfect host. He made us feel welcome and comfortable from the very first minute. He gave us loads of tips and good company making our stay an unforgetable expericence. The property itself is stunning. The clean house offers all modern comfort in a well preserved and perfectly maintained traditional interior. What kills it however are the breathtaking views you get from the windows, terraces and garden. From East to West, North to South, you get the most beautiful variaty of landscapes, woods, olive gardens, mountain views, the Lucca valley.. Words are not enough to describe all this beauty, you will have to travel there and see Casa Nuova with your own eyes. Reeds vanaf het begin van de klim naar ‘casa nuova’ kan je genieten van heel wat natuurschoon, afgewisseld met beelden van schattige Toscaanse dorpjes onder hun eigen, specifieke kerktoren. Eens boven, val je van de ene verbazing in de andere. Wat een omgeving, wat een tuin en wat een aardig huis! Casa Nuova is van alle comfort voorzien, biedt ruimte en privacy maar vooral : Dit huis heeft zijn authenticiteit bewaard! Het is er aangenaam vertoeven. In de enorme tuin vind je heel wat afwisseling. Je hebt er een groot zwembad voor ontspanning en afkoeling. Verder vindt iedereen wel zijn eigen plekje om tot rust te komen of te genieten van een goed boek of lekkere wijn… . Om het even waar je vertoeft, je raakt in de ban van fantastische vergezichten! Natuur- en wandelliefhebbers komen hier niets tekort en ook de fietsfanaten blijven hier niet op hun honger zitten! Cultuur en gastronomie zijn nooit ver weg, maar ook een ‘gewone’ pizza smaakt er heerlijk… En of we genoten hebben!!! The house and annexe were very pleasant. We found the villa difficult to find in spite of the directions and the road was uneven and bumpy with some very sharp turns. We have stayed at Casa Nuova for 3 weeks and have loved every minute of it. Very nice and clean home, amazing surroundings and lovely swimming pool. There's loads of room for the kids to run around and play ball, the patio near the pool is perfect for dining (whereby we were fortunate enough to see some deers whilst having dinner). Would loved to have stayed longer. The house is ideally located nearby Lucca, Pisa and the coast, with lots of small wonderful towns nearby to explore. Also Florence and Cinque Terre are within visiting distance from the house. It is everything that Tuscany has to offer. Wim and his staff are very friendly, incredibly responsive and accommodating. Wonderful! 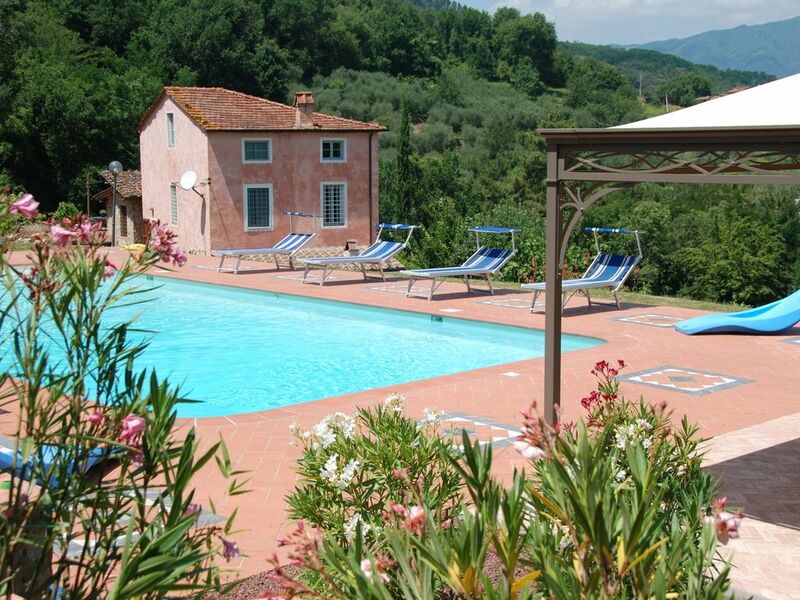 Casa Nuova is a beautiful farmhouse and converted barn with private pool, situated on the outskirts of the small village of Gugliano, at the top of a hill, 10 kilometres north and west of Lucca. There is no bar in the village but there are a number of bars, restaurants and shops in Ponte a Moriano, a 10 minute drive away. Five minutes from the house there is Villa Volpi, a hotel with an excellent restaurant. Casa Nuova is 20 minutes from Lucca, 50 from Pisa airport, 75 from Florence, 40 from the Versilia coast and 60 from the ski-resort Abetone. The scenery is spectacular, as is the peace at the house. All our guests enjoy the meals that Grazia, the cook, will come and prepare, if they wish, aiding complete relaxation while on holiday. She can also do pizza evenings, using the oven at the house. We can also arrange wine tasting - A landscape of wine and olives. A visit to wine producers in one of the two wine producing areas : DOC Montecarlo or DOC Colline Lucchesi where our guests enjoy locally produced salumi and other typical products as well as a comparative tasting of both red and white wines. Or there is the possibility for A Taste of Lucca. A 'food and wine lovers' walking tour of the town, introducing not only the historic centre within the city walls but also the traditional ingredients and specialities of the area and the individual specialist food and wine shops that still flourish in the town. If our guests wish, we can also organise a more in-depth wine tasting with a local Italian sommelier. Availability calendar will only be updated after receipt of your first payment.